Employees are evaluated both on a semi-annual basis and on an assignment or quarterly basis depending on whether the employee is within the Delivery organization or fulfills an internal role. The Semi-Annual Evaluations are completed in July and January of each year and reflect performance for the six-month time period preceding the evaluation. These forms also document strengths and development needs and serve as one input into the employee's Development Plan. In addition to the Semi-Annual Evaluation, Progress Evaluations are completed for all employees. For employees within the Delivery organization, Progress Evaluations are completed for all assignments longer than two weeks in duration. For internal employees, the Progress Evaluations are completed in April and October and document progress for the preceding quarter. 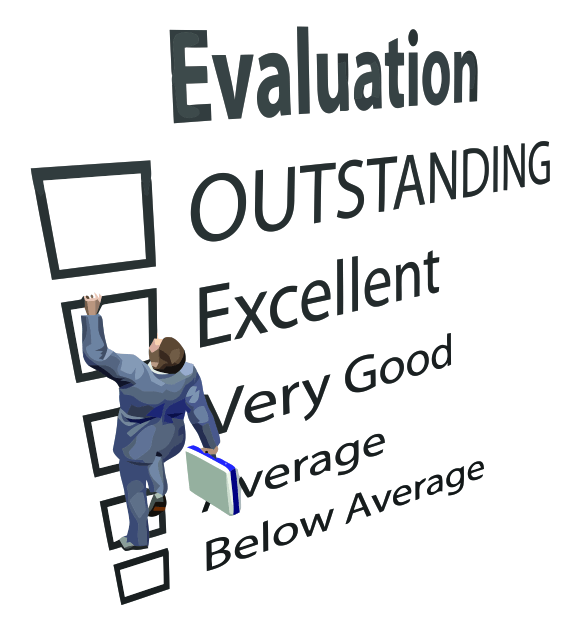 The appraiser completing the Semi-Annual Evaluation should consider the Progress Evaluations when evaluating the employee. The Company's process is built upon two levels of performance feedback: on-going Progress Evaluations and Semi-Annual formal reviews. Progress Evaluations: shorter and more frequent feedback about your performance on specific projects and initiatives. Semi-Annual Evaluations: a formal compilation of your Progress Evaluations within the context of your individualized Development Plan and The Company's career paths. It is during the semi-annual evaluation process that salary and promotion discussions are held. As mentioned above, Progress Evaluations are shorter and more frequent, and help ensure that you always know how you are performing. Execution of Progress Evaluations differs slightly depending upon whether you are a Delivery Resource or an Internal Resource. Delivery Resources: Progress Evaluations are done for any assignment you have longer than 2 weeks. Your direct supervisor for that assignment, not necessarily a manager, conducts the Progress Evaluation. If you are on a long assignment (e.g., longer than a quarter), a Progress Evaluation is completed at least every quarter – i.e., every Delivery Resource will have at least one Progress Evaluation per quarter. Internal Roles: your direct manager completes Progress Evaluations on odd quarters (i.e., in between the semi-annual evaluations). Evaluation Cycles: January & July of every year. Participants: Anyone who was with The Company for 2 months or more during that cycle. Evaluators: Your Practice Manager or Career Development Guide conducts your Semi-Annual Evaluation. This Practice Manager or Development Guide serves as your career mentor. He/She is a management-level person who helps you chart and meet your career development goals. For employees fulfilling internal roles, your Development Guide, in almost every case, is your direct manager/supervisor. Salary increases coincide with The Company's semi-annual evaluation process, and take effect on August 1 and February 1 respectively. You are informed of salary increases by a letter sent to your home. Please note that salary increases are prorated according to the number of months for which your performance evaluation applies. For example, if your evaluation covers 4 months, your raise is prorated to 4 out of the 6 months. The Company also conducts periodic studies to ensure that compensation is competitive and in line with market demands. Promotion decisions also coincide with the semi-annual evaluation process and are communicated during your formal evaluation discussion. The performance evaluation process is managed and coordinated on a regional basis-i.e., by the regional resource management groups. These groups support employees within the Delivery organization and employees within internal departments. Please consult the list below if you are unsure of the regional resource manager for your region. The job description for the employee being evaluated should always be consulted when completing both the Progress Evaluations and the Semi-Annual Evaluations as well as during the expectation setting process at the onset of a new project. An employee should be evaluated against the criteria set forth in the job descriptions, rather than against other employees at the employee's level. All of The Company's evaluation forms are derived directly from the job description or career path of the employee being evaluated. The Progress Evaluation forms correspond to the career path of the employee (thus Associate Developers through Senior Developers use the same form) and the Semi-Annual Evaluation form corresponds to the job description or specific role of the employee (Associate Developers, Developers, and Senior Developers each have their own form). Employees within the Delivery organization should use the appropriate forms depending on their career path and title within that path. Who should complete the form: The appraiser should be the individual who supervised the employee on a day-to-day basis during the course of any assignment lasting two weeks or longer. The regional resource management team will identify the appraisers and facilitate the completion and delivery of these forms on an on-going basis. These forms will be completed at least on a quarterly basis. When to complete the form: A Progress Evaluation should be completed as employees roll off any assignment that has lasted two weeks or longer. These forms should be completed at least quarterly. The appraiser should rate the employee in the various career path and project- related categories based on the rating scale included at the end of this document. The appraiser should comment on the specific responsibilities held by the employee on the project. The appraiser should document, in the “Other Responsibilities” section, any responsibilities that fell outside the norm for an employee at that level within that career path. Once completed, the appraiser should send a copy of the form to the employee for review. Once the appraiser has given the completed form to the employee for self-review, the employee should complete the employee comments sections. The employee should cite examples when appropriate to justify his or her comments. The appraiser and employee should then schedule a meeting to discuss the Progress Evaluation and make any necessary updates/changes. This discussion gives both the employee and the appraiser the opportunity to elaborate on the various sections of the evaluation, as well as to come to a clear understanding of what accomplishments were achieved. Based on this discussion, the appraiser has the option to change his/her ratings. The appraiser is not, however, required to change ratings where there is a difference of opinion. The employee also has the option to change his/her written comments. Once the employee and appraiser have discussed the evaluation, both individuals must sign and date the evaluation form on the last page acknowledging that the discussion has taken place. Signature does not necessarily signify agreement between the two individuals. The appraiser should forward the completed, signed Progress Evaluation to the regional resource manager. Who should complete the form: The appraiser should be the employee's direct manager. The regional resource management team will identify the appraisers and facilitate the completion and delivery of these forms on an on-going basis. When to complete the form: A Progress Evaluation should be completed for all Internal resources for quarters that are not followed by a Semi-Annual Evaluation. These will be completed in April for the period January through March and in October for the period July through September. The regional resource management teams will monitor the completion of these forms. The appraiser should rate the employee in the various career path categories based on the rating scale included at the end of this document. The appraiser should comment on the specific responsibilities held by the employee that quarter. When appropriate, the appraiser should add comments, to support the ratings. Once completed, the appraiser should send a copy of the form to the employee for review. Who should complete the form: The appraiser should be the employee's Practice Manager or Career Development Guide-an individual assigned by the regional resource management team to assist the employee with career planning and development. When to complete the form: Semi-Annual Evaluations are completed in July for the period January through June and in January for the period July through December. An employee must have been on board for a minimum of two months of the evaluation period to be evaluated in that period. Before beginning the process of writing the Semi-Annual Evaluation, the regional resource management group will provide the appraiser with all of the Progress Evaluations for that individual for that evaluation period. The appraiser should review those forms and rate the employee in the various categories based on the information included in those forms, his/her personal experiences with the employee, the rating scale included at the end of this document, and the appropriate job description and career path for the employee being evaluated. The appraiser should include comments for each category of skill, competency, or responsibility. Written comments are required when either an Exceptional Performance or an Unsatisfactory Performance rating is given. Once the written form is complete, the appraiser should forward it to the regional resource management group for review. When this review has been completed the appraiser will be notified that it has been approved for discussion at the employee checkpoint meeting. The regional resource manager may request that the appraiser make changes or clarify comments on the evaluation before approving it for discussion in the employee checkpoint meeting. Appraisers should not hold face-to-face meetings with employees until after the employee checkpoint meeting has taken place. All management-level employees will be required to attend the meeting to help decide whether a promotion will take place. Once the employee checkpoint meeting has taken place, the appraiser can move forward and schedule a face-to-face meeting with the employee to discuss the evaluation and the results of the employee checkpoint meeting. After the employee checkpoint meeting has been held, the appraiser should schedule a face-to-face meeting with the employee to discuss the evaluation and the results of the checkpoint meeting. During the process of scheduling a meeting, the appraiser should forward a copy of the evaluation to the employee so that he/she has an opportunity to look over the evaluation before discussing it with the appraiser. The face-to-face meeting and discussion give both the employee and the appraiser the opportunity to elaborate on the various sections of the evaluation, as well as to come to a clear understanding of what accomplishments were achieved and document the most crucial development needs. Once the employee and appraiser have discussed the evaluation, both individuals must sign and date the evaluation form on the last page. The appraiser should forward the completed, signed Semi-Annual Evaluations to the regional resource manager by the designated due date. Who should complete the form: The appraiser should be the employee's Development Guide. In almost every case with internal resources, the Development Guide is also that person's direct manager/supervisor. Before beginning the process of writing the Semi-Annual Evaluation, the regional resource management group will provide the appraiser with the Progress Evaluations for that individual for that evaluation period. At most, there will be one for internal resources, depending on when the individual joined The Company. The appraiser should review that form and rate the employee in the various categories based on the information included in that form, his/her personal experiences with the employee, the rating scale included at the end of this document, and the appropriate job description and career path for the employee being evaluated. Because the job descriptions for some internal groups are not yet complete, appraisers should use our standard “Internal Semi-Annual Evaluation Form” if a job description does not exist for the employee being evaluated. Only the standard employee qualities (which are included in every employee job description) and internal responsibilities (also included in every employee job description) are preprinted on the standard form. The appraiser should document the role-specific responsibilities of the employee being evaluated on the standard form in the blank space provided. The appraiser should include comments for each responsibility or quality. Written comments are required when either an Exceptional Performance or an Unsatisfactory Performance rating is given. Once the written form is complete, the appraiser should forward it to the regional resource management group for review. When this review has been completed the appraiser will be notified and the regional resource management group will facilitate the promotion discussion process. Once completed, the appraiser can proceed with arranging a time to meet with the employee to discuss the evaluation. Once a meeting time has been arranged, the appraiser should forward the document to the employee for review. The face-to-face meeting and discussion give both the employee and the appraiser the opportunity to elaborate on the various sections of the evaluation, as well as to come to a clear understanding of what accomplishments were achieved and document the most crucial development needs. Based on this discussion, the appraiser has the option to change his/her ratings. The appraiser is not, however, required to change ratings where there is a difference of opinion. The employee also has the option to change his/her written comments. The appraiser should forward the completed, signed Semi-Annual Evaluation to the regional resource manager. The rating scale below should be used for each competency, quality, and responsibility. Wherever fitting, the appropriate job description and career path should be used to determine the proper ratings. EP – Exceptional Performance: Employee consistently exhibited excellent performance and exceeded project performance expectations in core job requirements as well as Employee Qualities. Excellent professional skills and Employee Qualities indicate rapid future advancement. ATP – Above Target Performance: Employee constantly exhibited high quality performance and achieved core job requirements and Employee Qualities which indicate above average growth potential. OTP – On Target Performance: Employee effectively met core job requirements and Employee Qualities and displays average growth potential. BTP – Below Target Performance: Employee met some core job requirements and some Employee Qualities, however lacks some skills which could limit progress if not corrected. UP – Unsatisfactory Performance: Employee displayed significant difficulties in achieving core job requirements as well as Employee Qualities. Because the results achieved did not meet the minimum requirements of the job, the employee has a low chance of advancing beyond current position. NB – No Basis: Appraiser has no basis by which to judge the Employee.